Abyss Rising is a Booster Pack in the Yu-Gi-Oh! Official Card Game (OCG) and Yu-Gi-Oh! Trading Card Game (TCG). It is the second set in the OCG's 8th series, following Return of the Duelist. It is followed by Cosmo Blazer. The TCG version of the set is also available in the Abyss Rising: Special Edition. This set in the OCG was later re-released as part of a special bundle pack, EX Value - The Gold Box + ABYR&CBLZ. The set contains a lot of the latest cards from the Yu-Gi-Oh! ZEXAL anime. It includes more "Number" cards, cards used by Yuma Tsukumo, Reginald Kastle, Kite Tenjo, Quinton, Vetrix and Nistro. The TCG version of the set also includes cards used by Devack, Captain Corn and Thunder Spark. It introduces the "Heraldic Beast", "Mermail" and "Duston" archetypes/series to the OCG and adds further cards and support to "Abyss", "Gagaga", "Heroic", "Prophecy", "Madolche", "Spellbook", "Gigo", Nimble", "Fishborg", "Forbidden", "Penguin", "Ninja", "Ice" and "Elemental Lord". It also includes support cards for WATER and Sea Serpent-Type monsters. 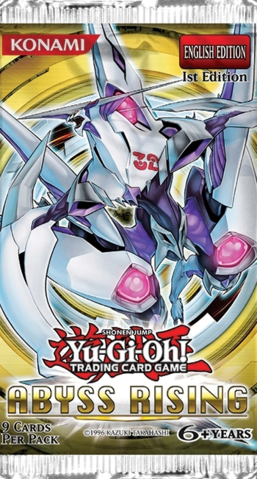 It introduces the "Heraldic Beast", and "Mermail" archetypes to the TCG. This page was last edited on 13 March 2019, at 15:03.